Post-choir dinner tonight: Lentils with peppers, good bread, and the feta and gourmet feta I made on Sunday. I’m really looking forward to it, actually. 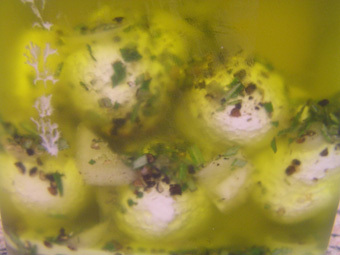 Greek-style feta in (too much) brine. Speaking of the cheeses, I finally cut and tasted them today. I’m moderately pleased – they are quite good, and with a little tweaking, I think they could be lovely. 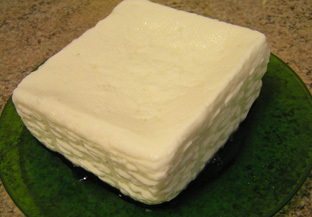 The feta has a very mild taste, which I like, and a really lovely texture; the only drawback is that I couldn’t get a small enough container to put it in, so it has absorbed more of the brine than it should and is very salty. I’m told that soaking it in milk will alleviate this, so I’m popping a large chunk of it into milk until dinner time. Sliced open so you can see the texture. You’d never know it started off looking like a lot of cubes of smooth tofu sitting on top of each other. 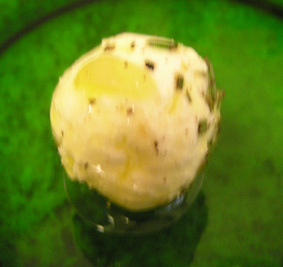 The gourmet feta I am less happy with – it has a slightly bitter aftertaste, and I’m not sure what is causing it. 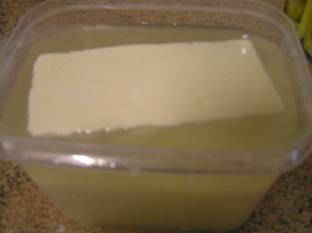 My gut feeling is it is something to do with the garlic or oil that I used to preserve it, but I’m not sure. Fortunately, this is a simple enough cheese that I can experiment with it fairly readily, and it may be that it’s a good cheese as it stands, just not to my taste. 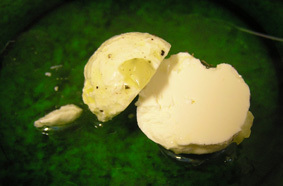 The texture is a lot better than I had expected – it was looking suspiciously like labneh when I went to cut it, which is why I rolled it into balls instead, but after a couple of days in oil, it’s definitely something you can slice cleanly. 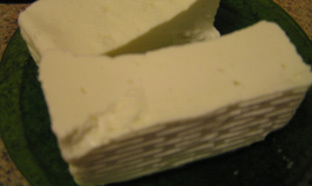 Gourmet feta sliced in half, to prove I can. In other news, my Mersu recipes have been published on the Mesopotamian Cook-Off at Silk Road Gourmet! I am (slightly) famous! If historically-based cooking interests you, I strongly recommend wandering over there and having a look at the other entries, and indeed at the blog generally. And all the links to other interesting history and food blogs. And… oh dear, where did my day go? It wasn’t that late when I posted it!